Those who have been enjoying the beauty of the game for some time now will agree that golf is a lot more than a fad. Recent stats show that the old-time myth that golf is for senior retirees or rich people only may have been debunked altogether. Each day, more and more people of all walks of life become engaged in this sport for many reasons. According to the American Medical Association, golf is actually a powerhouse of all the core ingredients that doctors recommend for optimum physical and mental health and wellbeing. Despite all these obvious benefits, many may argue that golf is a lot more than spending money on fancy clubs or bizarre clothing styles; and they would be right. After all, golf is a complex game. The good news however, is that solutions are usually simple. Better still, there are simple ways of explaining these solutions so that everybody, regardless of their level of expertise, can profit from the learning process. Finally, what have you got to lose? As with everything else in life, having a positive, upbeat attitude will help you make the most of every new experience, even from those that may seem too challenging to overcome. Once the initial fear is over, there are still quite a few aspects to be taken into account. The following golf beginner tips can be very useful if a long-term, sustainable golf-learning plan is being pursued. Potential players should know from the beginning that a DIY approach is not the best road to take in this case. Even if you are planning to follow the latest online tutorial or the most widely sought-after instructional book, teaching yourself can lead to unwanted, sometimes irreversible habits that may well be called vices. As with every sport, there is a set of general rules that may apply to all cases. Nonetheless, all practice should be as personalized as possible. Your coach or instructor can guide you through this process, by helping you to make the best choices about how and where to apply major discipline in practice. Similarly, knowing just what strategies to use and how much to push a learner is something only a professional coach can manage. To round up,adjusting any of the various already existing programs might be a good place to start. However, lack of personalization may lead to average performance, which is obviously not the ultimate goal for those enthusiastic players who are looking to make the most out of their golfing experience. Most beginners become almost obsessed with practicing at the driving range. And even when practice is essential, neglecting your putting may set your whole learning process back several slots. Since putts account for about 50% of the strokes in a round, looking for ways to improve your putting will surely pay off in the long run. Speak to your coach about this goal and learn from other players’ previous experience. Statistics on this aspect are somewhat confusing because despite its importance, putting is often underestimated. 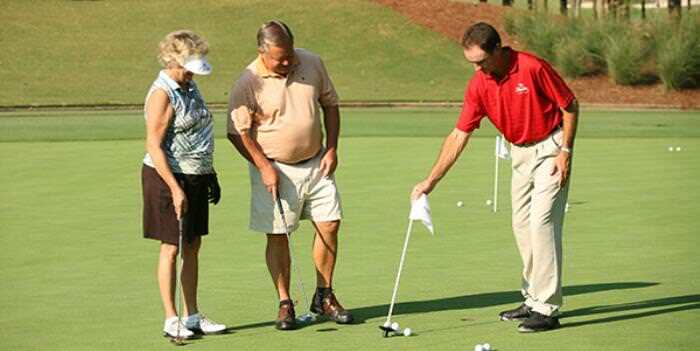 Ironically, most beginners spend less than 50% of their time practicing putting. Because your hands is the only part of the body that comes in touch with the club, getting the grip right may turn out to be essential. 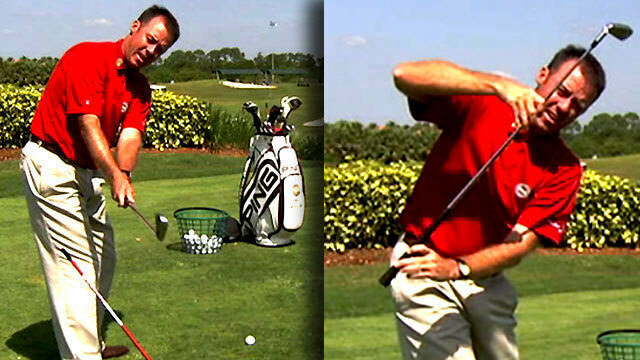 You should therefore, focus on how to hold a golf club as the first big step to developing an exceptional golf swing. An expert can lead you through the process of learning how to adjust your grip. The bad news is that gripping your club may be challenging and that there are so many ways to get it wrong. The good news is that there are countless alternatives, many of which may lead you to get it right. Once and again, personalization at this point may be useful since each player must develop their own range of gripping options. 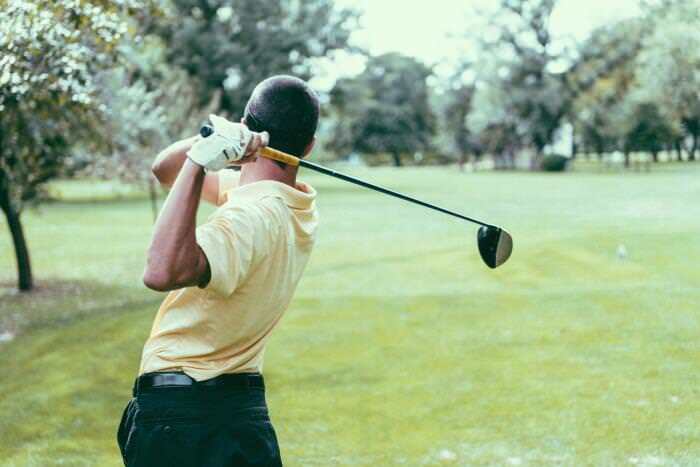 Since holding a golf club is one of the most relevant pillars of an effective golf swing, even the most minimal change to the position of the hands may have a tremendous impact on the outcome of your swing. Popular among beginners, this grip is also known as the ten-finger grip.As explained at the Perfect Golf Swing Review, many golf instructors recommend a baseball grip for children, senior golfers or female golfers. This grip is believed to create the possibility of a getting greater leverage for the golfer. In fact, leading experts agree that whereas most golfers would be better off avoiding this grip altogether, beginners will find it easy to learn and use. Oftentimes called the Vardon grip, this grip was made popular during the first years of the XXth century. Harry Vardon, great English golfer at the time, made it his trademark and pros all over the world have picked it up and have been using it since then. In this grip, the right pinky finger is placed on top of the small gap between the left index and middle fingers. The gripping action of the 5th right finger helps to keep the two hands together so that they can function as a single, cohesive unit. There is another perfectly acceptable Vardon grip variant that consists in resting the right 5th finger over the top of the left second finger, rather than resting the 5th finger in the groove just between the second and third fingers on the left hand. The choice of this variant over the more traditional grip is a matter of personal preference and your coach will help you find the most suitable alternative for your case. There are numerous advantages of using this grip. For starters, most instructors agree that golfers with larger-than-average or strong hands will find it natural. In addition, this grip provides the much-needed unity between the hands without hindering their movement, thus liberating the golfer to fully release the club through impact in those powerful shots. On the downside, even when many golfers find this grip more comfortable than the interlocking grip for instance, players with small or weak hands may have difficulty when it comes to controlling the club. One of the main advantages of this grip is that it allows players to unify their hands tightly, therefore reducing excessive and completely unnecessary wrist movement. Another pro concerns grip tightness as it provides players with a firm hold of the handle without having to squeeze too hard. According to most leading coaches in the field, this is perhaps the best pick for golfers with smaller-than-average hands. On a less happy note, while some players find the interlocking grip uncomfortable, or even awkward, others claim that it limits free movement of hands or wrists. Even when these three grips rank among the most popular ones, they are definitely not the only ones available to choose from. Considered by some experts as the ideal grip position because it aligns the hands directly with the clubfacethe neutral grip calls for less manipulation to keep the clubface square to the target line all throughout the swinging process. If you can see two knuckles on your left hand when addressing the ball, this means that your grip is neutral. Besides the alignment benefit, this grip won’t cause slices or hooks. In addition, this grip makes it less complex to work the ball in either direction by hitting fades and draws. Whereas some golfers regard this grip as being 100% disadvantage-free, others may find it unnatural or even uncomfortable to use. Bet you are thinking that these categories involve firmness or strength of grip. However, you should know that these terms have no connection with how strong or how firmly you hold your club. In a strong position, the hands are turned to the right of the handle. A practical way of determining whether your grip is strong or not is to check the position of your knuckles; if more than two knuckles on your left hand become visible, then that is a strong grip. The most obvious advantage of this type of grip is that it is perhaps the most natural way to hold the club. Plus, because a strong grip allows golfers to rotate their arms more freely, it is useful for enhancing the release, whilst reducing the chances of a slice. By using a strong grip, it is also much easier to get a low, carefully controlled shot trajectory, as well as hit a draw. On the downside, when the player’s hands are somewhat overactive, a nice draw may be turned into a dreaded hook. Finally, if your grip is overly strong, hitting a ball with sufficient height and backspin can become a great challenge. In this grip, the hands are rotated to the left on the handle. A weak grip takes place when only one knuckle on your left hand can be seen at address. One of the main benefits of using this grip is its remedial effect when it comes to curing a bad gripping habit, for example. Besides, since this style keeps the clubface open, it can contribute to helping you hit the ball higher and with further backspin than when using other grips. On the other hand, most players claim to feel uncomfortable when arm rotation is compromised to such a large extent. Furthermore, a weak grip generates most golfers to slice and can make it challenging to properly release the club through impact. Most beginners may feel tempted to start with a traditional club. Nonetheless, a cavity-back or peripheral-weighted clubs usually have a larger head, as well as a larger “sweet spot”. This means that the area that comes in contact with the ball is much greater, allowing each shot to be more precise. Cavity-back clubs make an optimal choice for beginners, but can still be seen used by some professionals who prefer to maintain a more conservative approach. This will help you feel less of a rookie. If, in addition, you can still be considered as a young beginner player, you may want to take a look at some of the beginners’ sets or else a half set of clubs. We all know that enthusiastic novices may feel prompted to buy every single piece of equipment available on the golfing store. However, at this point in your training, a full set of 14 clubs is not what you need. Make sure that you pick clubs that have perimeter-weighted heads because they will be gentler on your lack of experience due to having an expanded “sweet spot.” Even when they are more expensive that steel shafts, graphite shafts are ideal for the beginning golfer. Since they are lighter, more of the club's weight is in the head, thus making it easier for you to swing the club a bit more speedily. Purchase a half set of clubs that are made for beginner golfers. Most half sets consist of five irons--a four, six, eight, pitching wedge and sand iron as well as a three- and five-wood and a putter. This means that you should leave out the driver and two, three and four iron that are especially hard for a beginner to hit. Apart from being easier to use, half sets are much cheaper to buy, too. Finally, when the time comes to choose a club for your game, you will find yourself doubting much less than if you had to pick from the full range of club options. When the time comes and you are ready to take the following step, you can add the missing clubs or else trade for a full set. If you still insist on using a traditional bladed club, make sure that you are ready for some disappointment until you manage to develop a decent grip or an effective shot. Even pros take their time to try their clubs before actually purchasing them. Most large sporting goods stores have indoor driving ranges designed to try new clubs. Likewise, pro golf stores allow shoppers to hit a few shots on the driving range, too. This however, cannot be done if you are planning to buy your first set of clubs online. Even if you can spend much less by doing so, you may not be able to return the clubs after they have been purchased and shipped. Finally, trying the clubs is essential if you are planning to buy secondhand ones. The first thing you should pay attention to is the clubs’ grips. Make sure that they are in good condition. In fact, many inexperienced shoppers choose to go shopping with an expert. If none of your friends are into golf at all, you can pay to have this simple task done. Rounding up, not all clubs are suited for all players, especially when you are a novice. Consequently, getting the right clubs for you is vital if you are looking for ways to optimize your first golfing experiences. Ok, here’s the point: even if you are not planning on turning pro, there is no harm in mimicking their posture or trying to imitate the technique, right? Research has shown that proper posture involves much more than just looking good. It is all about physics. 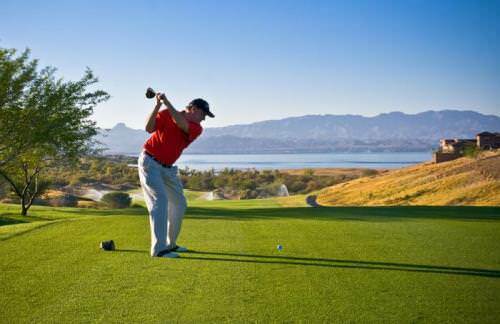 An improper body swing can generate muscle imbalance that may in turn, trigger loss of energy for the actual shot or even change in trajectory. Even worse, a vicious posture may also be responsible for generating body injuries that involve shoulders, wrists, back or leg muscles and joints. Although each individual is different and some of the kinetic alternatives will be adapted according to each case, there are several postural tips that you ought to follow. An athletic golfing posture will be better achieved if you regard of your body as an evolving unity, starting from the ground and moving upwards. Positioning your feet properly is vital in order to develop the right balance. Create a dependable stance which is wide, solid, stable and even. In most cases, the key is to begin by aligning your feet with your shoulder width. Position the ball 3 to 4 inches inside the left heel (for a right-handed golfer) for a standard iron shot. Position the ball off the inside of the left heel for a standard driver, 3-wood or 5-wood shot. Then, align your feet parallel to your target line. Turn your left foot out toward the target approximately twenty degrees, in relation to the target line. This will allow your hips to turn toward the target at impact and all throughout the follow-through. Additionally, this will promote a correct weight shift to your left foot on the follow-through, as well. Keep your right foot square, or perpendicular to the target line. This will help you rotate only as much as you need to with your hips on the backswing. Over rotation of your hips at this point can pull you off balance, therefore messing up your entire swing, plus risking your body to suffer from unwanted injuries. Also, make sure that your weight is evenly distributed on each foot before you take the club back. If you place too much weight on one single foot, this can prevent you from making the right weight shift when necessary. Weight should be centered on each foot, rather than unevenly balanced on your heels or toes. Beginners with over pronation issues might want to practice this a bit more thoroughly before hitting the range. 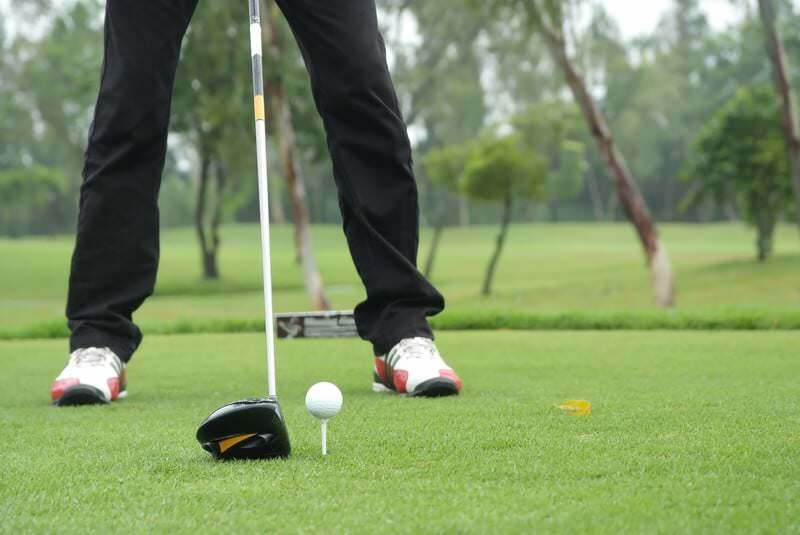 Lastly, as the club is being taken back, make sure that both feet are kept flat on the floor. As your hips turn on the backswing, most of your weight will move to your right foot. Consequently, make sure that you transfer your weight back to your left foot as you swing down and through the ball to your finish. Finally, end up with your left foot flat and your right heel directly over the toes of your right foot. Your weight is supposed to be almost entirely on the left foot at the finish of the golf swing. Leading golf instructors agree on using this tip for beginners who are struggling over this issue: visualize your posture by focusing on the hips rather than on the waist because the key lies in swinging your hips. In fact, if you do some research you will find that nearly every down swing fault occurs when players start with the upper body rather than literally “bumping their hips”. It is a kind of wave motion that begins from the hips and continues through the upper body. Attempting to do this the other way round may be both frustrating and useless. Rounding off, your hips should turn away from the target as much as you can. Improving your address posture is the first sure step towards a successful shot. We all know you are anxious to hit the course. However, beginners who have practiced long enough on the driving range before have a better chance of profiting from their first actual course experience. Organize each session by including 50 balls. Also, make sure that the whole session lasts 30 minutes with at least two practice swings for each ball. This plan will prevent you from practicing randomly and is about one of the most useful golf beginner tips ever. When you are ready to hit a golf course, go for A-par 3 Course. These types of courses are optimal to develop your understanding not only of the game, but also of your course management abilities. Believe me when I say that you don’t want to waste your first session looking for balls in tricky places. When you are ready for your first round of golf, make sure you have prepared everything you might need beforehand. Since a round could last for several hours, take items like waterproof clothing, umbrellas, something to drink or to snack on; but above all, plenty of balls –they never seem to be enough! Soon enough you will find out that there is a lot more to golfing than just swings or drivers. From dress code to dos and don’ts, there is plenty of information you will take some time for you to absorb. Relax, no one expects you to learn everything overnight. After all, like all beginnings, getting used to the rules of the game may take a while. A good tip is to find a more experienced buddy who is willing to aid you in your first golfing experiences. This way, you will have somebody to turn to for those unanswered questions that are keeping you from enjoying the game. Luckily, because golfers are usually more sociable than one might think, you will end up having numerous chances to partner up with other players. In fact, make sure that you always take some extra cash for the end-up the game meets in the clubhouse, also known as the 19th hole. On these occasions, players of all levels of expertise compare their scoreboards, show off their latest equipment acquisitions or just remember golfing stories together. Listening to their tales and hints will further expand these golf tips for beginners. After all, always keep in mind that golf is a game and playing it should be fun. Best of luck and let the golfing begin!